When you’re ready to shop for a refrigerator, there are many different factors to consider when finding just the right unit for your needs. You may need a little help choosing the right one. This is the first of several shopping guides we will be publishing covering numerous aspects of kitchen design. We want to make sure that you go into the marketplace with confidence knowing just what you’re looking for, and not be sold something that is more than what you really need. Or worse, less than what you really need or not right for your space. 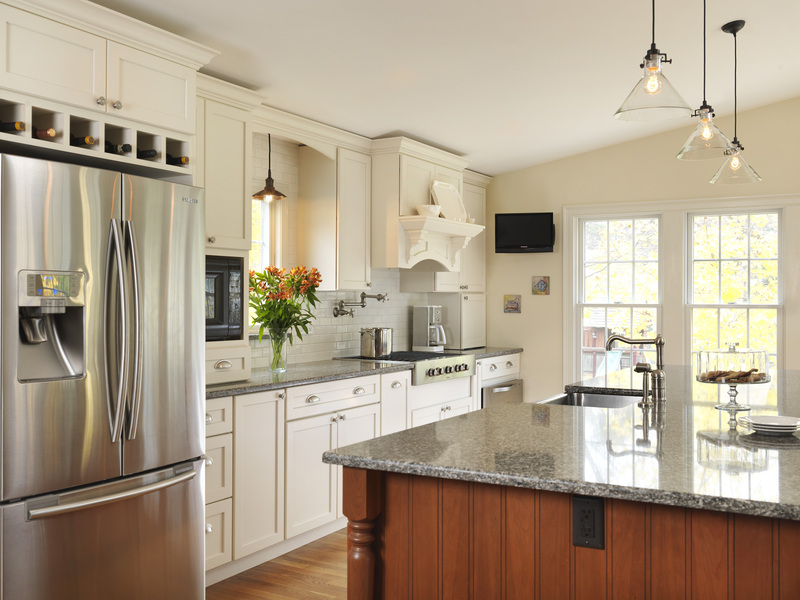 First and foremost, if you’re going to be placing your new appliances in the same place as your current ones, know the exact dimensions of the areas where you will be placing them. If you intend to move the location of your appliances, make sure that they will not only fit there but be easily accessible. Also if you’re moving the location of your appliances, especially in the case of a refrigerator, you need to be able to open the doors on all of the surrounding cabinets with ease, in addition to confirming that the refrigerator doors can open properly. Another important thing to consider is the type of doors you would prefer for your new refrigerator. It’s very important to know if you want doors that open on the left, doors that open on the right, or a side by side appliance. You may also be interested in a refrigerator with a freezer on the bottom rather than the top. Next, it’s very important to consider capacity. Think about how much interior refrigerator and freezer space you will want, and how many people will be using it. It’s especially important to consider the freezer size if you are planning to keep large amounts of frozen meals or bulk purchases of meats, etc. If you’re working with a small space, you may even consider a compact or portable refrigerator, which could include one that could be installed under a cabinet. You may even have interest in a drawer refrigerator or one that can fit under a countertop. Lastly, think about what types of features you want for your refrigerator. Such features might include an ice maker, a water dispenser, door dispensers, or a water filter unit. Don’t forget placement of water lines for the freezer to produce ice cubes and/or cold water. Also, consider what types of compartments you need for my refrigerator. Do you want specialty shelving, climate control compartments, or wine holders? If you don’t need these, then it is wise to not buy a unit that has them integrated. Also, if you are interested in appliances that will conserve electricity or water, it may be well worth it to spend more on a energy-efficient unit now in order to save money on future utility bills. Kitchen Views has many printable questionnaires to take with you when you go shopping for your various appliances. Check out the Design Guides section of kitchenviews.com. The questions in these guides are a good way to help you narrow your options and make the right choices. Consider printing out these questionnaires and taking them along with you when you shop.